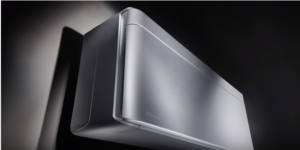 Daikin has expanded its range of residential air conditioners with R32 gas thanks to the Stylish model, available in three colors: White, Silver and the new Blackwood. In just 185 mm depth it offers a high technological content for comfort and energy savings. The product, proposed at the last edition of the trade fair Mostra Convegno Expocomfort, is in class A+++ (both in cooling and heating) and has an air purification system with Daikin Flash Streamer technology, humidity sensor, Grid Eye Sensor system to determine the wall temperature and the Coanda function for better air diffusion in the environment avoiding direct flows.